Watch this video on YouTube. Download a PDF of the captions. We understand that no one wants to lose their trees, but please be assured that right-of-way trimming is a necessary step Lake Region Electric Cooperative (LREC) takes to ensure greater safety for workers and the public and to ensure more reliable service for its members. Trees are one of the leading causes of unplanned service interruptions, including both sustained and momentary interruptions. Our goal at LREC is to provide safe, reliable electricity and keep our member rates as low as possible. With the help of our members, our right-of-way program will keep our lines clear of trees and overgrown vegetation while reducing future cost to members in terms of health, finances, and time. If you have further questions, please feel free to call us at 918-772-2526 or toll-free at 800-364-LREC and ask for James Cook, right-of-way supervisor. 1. If landscaping is needed near right-of-way, choose low growth shrubs under 5 ft. tall. 2. 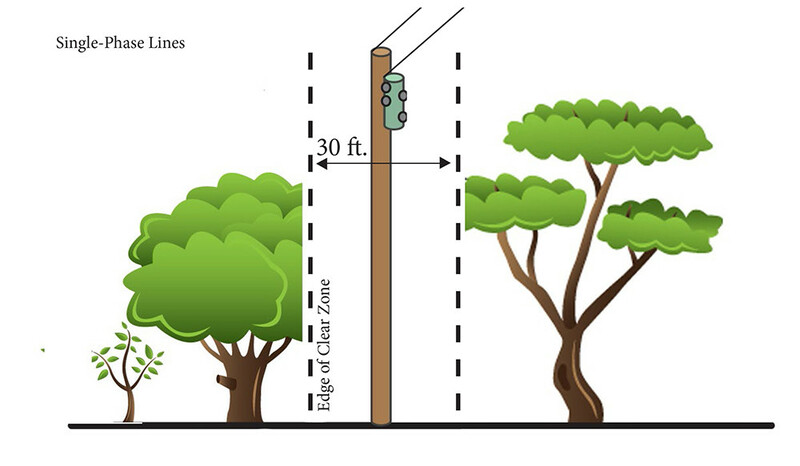 Smaller trees need to be planted at least 20 ft. away from power lines. 3. Medium trees need to be planted at least 35 ft. away from power lines. 4. 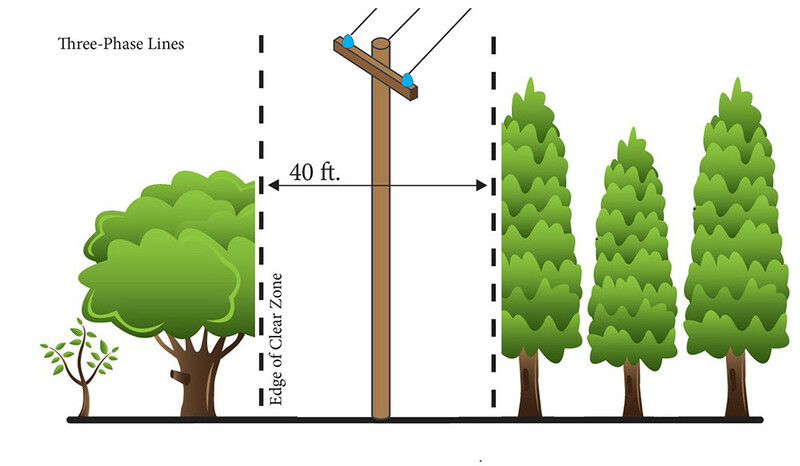 Large trees need to be planted at least 45 ft. away from power lines. 5. Trees planted too close to the power lines will always be misshapen by unavoidable pruning of limbs to prevent interference with power lines. Trees growing near power lines or electrical equipment may need to be pruned or removed to prevent service interruptions and maintain safety. If you notice a tree with branches growing close to - or touching - power lines, please complete the following form and submit it online. We do not trim trees past the electric meter. Are trees flagged or marked? If you would like to meet with one of our employees to discuss what needs to be done, or if you have any specific instructions or concerns (ex: septic lines), please leave remarks here.